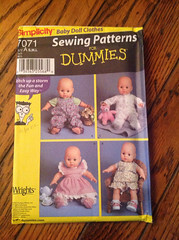 Simplicity 7071: The overalls from this pattern are on the baby in the back. They are, indeed, too large for this baby, but that’s because they were made for a larger baby. My daughter has her own ideas about who gets to wear what. After searching through my Ottobre and Burda Kids magazines for the absolute best knit garment to make with the green knit scraps, I traced a pair of pull on pants. Ottombre made them from velour. I couldn’t tell if it was stretch velour or not. Alas, I was short fabric by about an inch. I didn’t find anything else in the magazines that I thought I could make with the fabric scraps, so I pulled out my stock of kid’s patterns. 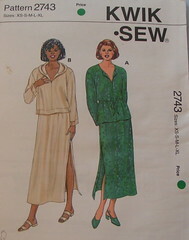 I’m going to give Burda 4978 OOP a try. 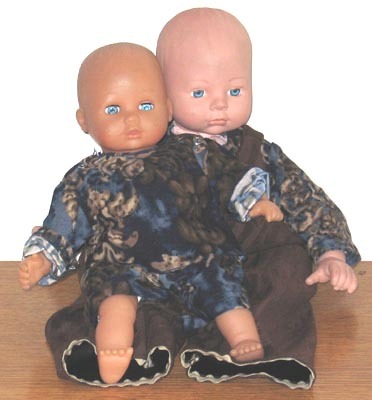 These are a pair of baby pants with a front and back yoke and rolled cuffs. 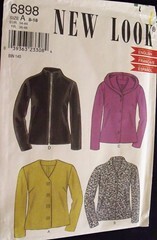 It’s a Canadian Burda pattern. The dimensions are in both cm and inches, but there’s a note in the instructions that all sewing terms are American. I’m going to have to ask the Canadian sewiers if they have a different sewing vocabulary. Well, I gave into temptation and bought more fabric. I have this thing about orange and pink in one fabric. My mother used to make negative comments about women who wore orange and fuschia together, and …somehow … I love orange and fuschia or orange and pink together. And I like this one, too. Burda Plus Winter 2003 retro skirt I did not have my skirt fitted. I ended up ripping the whole thing apart and resewing it. The @#$%ing thing was too big. I’ve got to get over my fear of making something too small and trust my measuring & fitting skills. The petersham ribbon didn’t work because you need to plan for it from the beginning. I had not. However, it is now completed, and I’m happy that it’s done. 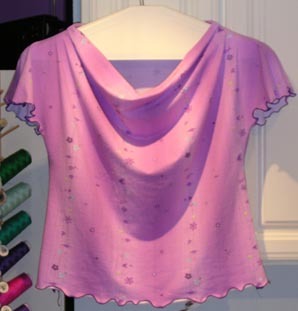 McCall’s 3085 OOP Finished! Now to wear them and review them. Kwik Sew 2743 OOP Finished! Working late at night in poor light is not the best way to sew. I noticed that there is a fade line down the center of the fabric I used to make this skirt. Kwik Sew 3028 The pattern seems to fit without any alteration, so I cut out Robert’s sweatshirt. New Look 6898 I had enough of the fabric left over from Robert’s sweatshirt to cut out the shawl collar view. I love this pattern. This will be the third time that I’ve made it. New Look 6106, View B I decided to hem the sleeves instead of doing a rolled edge. Burda 8841 OOP? I put off the decision on how to hem the necklines and put in the sleeves. The shorts are ready for the waistband elastic. Kwik Sew 2743 OOP I finished the waist and sewed the sides. The elastic is cut. All that needs to be done is finish the waistband and hem. Kwik Sew 3028 Robert’s chest is 41.5 inches, so I traced a size large in the pull-over sweatshirt. 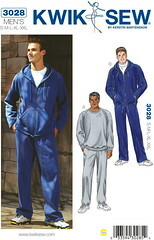 He wants a plain sweatshirt out of Windpro with sleeves that are long enough. First, he’s going to get a fitting toile in olive sweatshirt fleece from a garage sale. 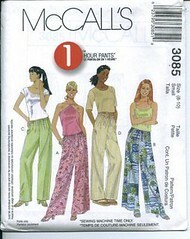 McCall’s 3085 OOP I had to cut the front crotch down by 2 inches and the side by 1. They are all finished except for hemming. I’m going to wait until I’ve got the serger set up for coverstitch. I’m pretty happy with them. I love palazzo pants. I don’t care if they are in or out of style. They look nice and are comfortable for work. Kwik Sew 2743 OOP I serged the sides of the skirt panels with a 3-thread narrow overlock stitch. Usually, I forget to do this before hand on a seam that has a vent at the bottom. It’s a lot easier to do before sewing the seam. I think I’ll finish the waist, too, before assembling. Well, it’s been a whole 5 days since I bought fabric. Sawyer Brook‘s Spring Swatch Set II came in the mail las night. They are offering several fabrics that I really like. It’s not like I need anymore fabric, and I’m pretty much out of space to store it. I guess I’ll find out if I have more strength to resist than a wet noodle. Well, so much for not buying more fabric. I met a friend from Pattern Review in Oakland on Tuesday. We went to Poppy Fabric, and I found a funky, cotton/lycra twill stripe fabric and coordinating Día de los Muertos fabrics. Then it was off to Stone Mountain & Daughter. Well, we stopped and fortified ourselves with Japanese food before taking the Stone Mountain plunge. I was able to resist until we went upstairs to the clearance fabrics. They had some polyester mesh knits. One was a border print with scenes from India. They had 2 colorways, but the blue was really cool. I had to buy a pattern to go with it, too. I wanted to make a t-shirt dress, but all my patterns have a seam up the back and a back vent. I wanted one with one front piece and one back piece to better show off the fabric. I picked Neue Mode S22690. All in all, not bad. Then, my son got sick with hand, foot, and mouth disease. I was feeling sorry for myself, yesterday, being stuck home with a very needy, sick toddler. I put him in the sling, and we went shopping. Joann’s had a shipment in of linen/rayon novelty stripe fabric, just what I was looking for for a big over shirt. The silkies were on sale, and I helped myself to 2 jacquards, dragonflies on black and butterflies on pink. I found an orange and pink plaid cotton/linen/lycra in the clearance section. Oh, well. 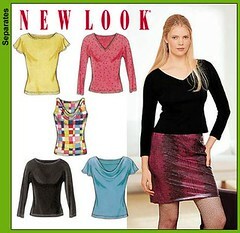 New Look 6106, View B I haven’t had a chance to sew much. I marked this top, fused interfacing to the back facing, and sewed the back facing to the back. I was going to sew the shoulders. Fortunately, I realized that I had not sewn the darts. I did this on another t-shirt, and it’s a lot easier to sew the darts before attaching the front to the back. when I tell it, but DH & I laughed aloud at the time.